This week we visit another new church, our third one so far (the others are Church #2 and Church #7). 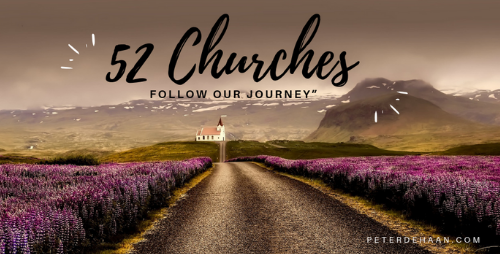 This one is essentially a church reboot, with the intent on offering a more accessible gathering within a traditional, conservative denomination. It’s a bold experiment. The decor is by far the nicest we’ve encountered. Everything looks new; nothing is worn or dated. I suspect the touch of a professional interior decorator. There are several inviting sectionals, making the lobby look more like a den than a church. Beyond it is the sanctuary, which is wide, but not deep. It has padded chairs. These traits are common in all three of the new churches we’ve visited (as opposed to longer, narrower sanctuaries with wooden pews). This church arranges their chairs in a 180-degree arc; everyone is close to the front and has a good view. There are ten on the worship team, with half singing and half playing: guitars, drums, and keys. The opening song is seemingly for entertainment, without words, no one sings along. But soon words appear overhead and the people gladly join in. Some raise their hands in varying degrees of physical worship. Plans are underway for Vacation Bible School, held in partnership with other area churches. I appreciate their ecumenical spirit in working together. The pastor begins a new series on the book of Philippians. He asks, “What does it mean to rejoice?” and then reads chapter one from the NIV Bible. The chapter arc is of Paul in jail, facing almost certain execution—and rejoicing. After the service a couple introduces themselves. They confirm my understanding of the church’s formation, calling it as “a bold experiment”—one that not everyone at the founding church is enthusiastic with. As for me, their bold experiment is wildly successful.